CAPE CORAL, FL, April 29, 2013, Sheri A. Bullock, Kindergarten Teacher at Cape Elementary School, has been recognized by Elite American Educators for dedication, achievements, and leadership in primary education. Ms. Bullock, a teacher with more than three decades of professional experience under her belt, feels that she has been able to help children to learn and grow over the course of an illustrious career due to a genuine and innate love of her profession. Other important attributes for her success as an educator have been extreme patience, her being a good listener and remaining laid-back and flexible, and her passion for never giving up and determination to help her students to achieve their goals. Ms. Bullock became involved in her profession because she always wanted to be a teacher, work with children, make learning fun and witness the ‘a-ha’ moment. Ms. Bullock’s favorite quotes are “Do a job, big or small. Do it right or not at all,” and “That’s a good mistake.” She advises others entering into the profession to roll with the changes, not take everything so seriously, relax, be open to change, and have fun. She enjoys working with children and seeing what each child brings, for they are all special and unique. Ever the creative individual, Ms. Bullock enjoys collecting Swarovski crystals and nurturing her creative spirit when she is not helping her students to achieve continued growth. She would like to dedicate this recognition to her family: Carlos, Lindsey and Garrett. 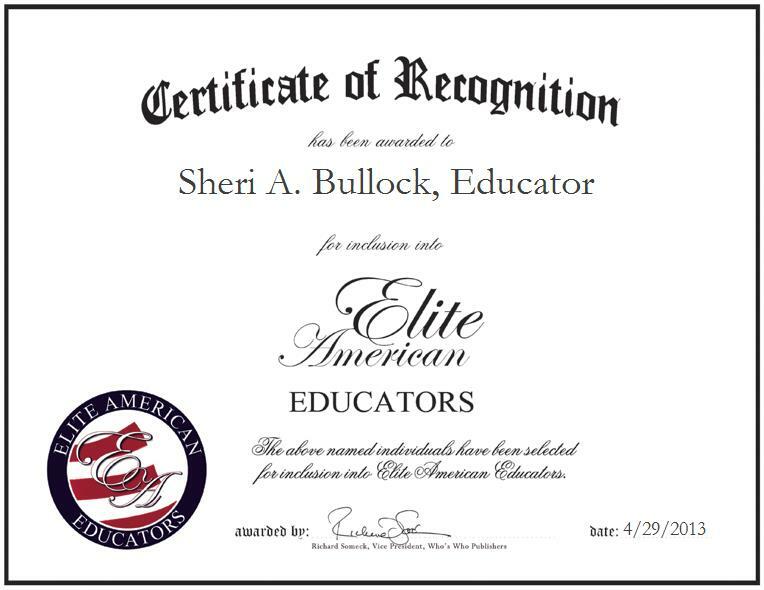 Sheri A. Bullock was originally selected for inclusion in EliteAMERICAN Educators in April 2013. We are proud to be featuring Ms. Bullock again in EliteAMERICAN Educators for 2014-15.